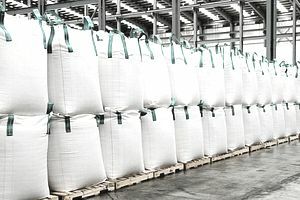 Bulk bags – also called FIBCs (flexible intermediate bulk containers) or builders bags – are industrial containers used for storing and transporting bulk goods. They were designed to be a more cost-effective and environmentally-efficient alternative to using multiple sacks. A single bulk bag can replace a pallet of sacks, requiring less cost and fewer materials. Traditionally, bulk bags were made with PVC rubber, but modern-day FIBCs are fabricated from a woven polypropylene (PP) fabric, and hence they are sometimes referred to as PP bags. Polypropylene is resistant to mildew. It also has moderate resistance to heat, shrinking and stretching. Woven materials are stronger and of higher quality than nonwoven fabrics because the layers are woven over and under each other. The strength, durability, and reliability of bulk bags make them an eco-friendly choice for carrying a broad range of materials, from sand and powder to pellets, aggregates, and plastic granules. FIBCs can be reused if they have been treated correctly, but they must be multi-trip bulk bags with a 6:1 Safety Factor rating. Some companies provide FIBC cleaning services, including collection, inspection, and cleaning, so that they may be returned for further reuse. Reuse of FIBCs encourages sustainability and a circular economy, as reusing refurbished bags reduces waste and dependency on raw materials. Bulk bags are recyclable. Most FIBCs are made from virgin PP, a common plastic that can be repurposed into other plastic products, such as battery cables, brooms, brushes, trays, bins, and auto parts. The types of big bags that are suitable for recycling include those used to store chemicals, fertilizers, grains, construction materials, pigments, and plastics. Bags for recycling are classified by different grades: Grade A (clean, bright white; colored stitching and handles allowed); Grade B (not as clean, predominantly white with minimal coloring); and Grade C (dirty or colored bags). Like with other industrial plastics, the recycling process begins with the proper collection. Recyclers require that the material be compacted into bales for easy collection and optimal market value. FIBCs are collected in large quantities, so recycling is usually feasible only for businesses with a sizeable output, or ones that can store the bags over time. Once collected, the mill-sized bales are taken to a reprocessing center, where they are sorted and cleaned. As they are commonly used to transport a variety of materials, including fertilizers and chemicals, it is essential that bulk bags are thoroughly decontaminated before being recycled. All zips and buttons are also removed. Next, the bags are resized into small flakes, making them easier to handle for further processing. The plastic is fed through shredders and granulators with industrial blades that cut rotationally to chop it down. After cutting, the plastic regrinds go through a separation process to differentiate further contaminants from the plastic polymers. With the advanced technology of today, plastic can be separated by size, shape, color, melting point, and even the ability to absorb light. The final phase is compounding, which involves putting the regrinds through an extruder, where they are melted down at 240 degrees Celsius into uniformed beads, also referred to as pellets or granules. The mixture is strengthened through the addition of virgin polypropylene. A variety of new products can be manufactured from the pellets as the bulk bag recycling process comes full circle. This loop can be repeated over and over, as polypropylene can be safely recycled many times. David Dawber​ is MD of Cliffe Packaging, a leading supplier of FIBCs.